Have you ever wondered why one person can have great success with a deck sealer year after year, while another person using the same sealer has peeling issues, warping wood and other problems? Of course, there could be a lot of reasons, but there is likely a good explanation. Consider, for example, what happens when you take a piece of lumber and submerse it in water. If that board is untreated, water will pass through the wood into the pores bi-directionally, or in two directions. The wood will retain its shape though swelling may occur. This is one basic reason why the wood on ship wrecks that have sat at the bottom of the ocean for hundreds of years are still in the same condition as when they sunk. Another good example of this is when a hardwood floor has sat under water due to a flood. The floor boards will warp so thoroughly that they will pull the nails out of their substrates and the tongue and groove will separate. Take that same piece of wood and place it in a puddle of water so that the bottom of the board is wet and the top of the board is dry. Water will move through the pores from the bottom of the wood up into the top of the wood, evaporating at the surface. In this situation, water is only moving in one direction. When water moves in a single direction through the wood, the wood will start to warp and crack as the proteins and fibers within the wood realign and cross link. The extent, speed, and type of warpage are determined by several factors including the resins within the wood, the size of the pores, the length of time it remains wet, the temperature, etc. Inevitably, the wood will warp, crack, and perhaps cup. Deck treatments fall into two categories, those that seal the pores of the wood completely (we’ll call them Group A), and those that leave the pores open (Group B). Some Group B treatments will act more like Group A if the sealant is applied too thick, so it is important to follow the manufacturer’s suggested application guidelines. Leaving the wood pores open will allow bi-directional water movement. 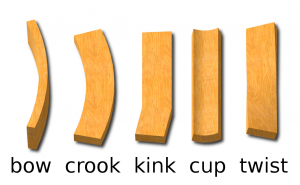 The wood should retain its shape, not cupping, cracking or warping. The Tri-Pups, Inc. staff recommends that you use sealants that keep the pores open when you can’t seal every side of the wood. Decks built at or slightly above ground level should always be treated with sealants from Group B leaving the pores open. Some examples include Penofin Blue Label, Cuprinol Decking Oil and Protector, Behr Premium Semi-Transparent Weatherproofing Wood Stain, and Sherwin Williams Deckscapes. Group B sealants can be used for most exterior wood surfaces. For upper balcony decks, open staircases, outdoor furniture, and fences that have wood that can be treated on all sides, you can use either Group A or Group B sealants. The use of a Group A sealant can eliminate water passage of any kind, from all directions. Examples of Group A sealants include the entire line of Thompson’s Water Seal products, Olympic Maximum Waterproofing Sealant, and Olympic Wood Protector Waterproofing Sealant. The situation to avoid is sealing one side of a wood surface with a pore sealing Group A product when the other side of the wood is inaccessible and therefore remains with untreated open pores. In this instance, water will still pass through the wood from the open pore side into the sealed pore side. Because the pores on top are sealed, the water movement is mono-directional leading to warping. The wood doesn’t have to be physically lying in water for this to occur. Temperature and humidity differences can cause condensation and capillary action, wicking and water intrusion. The effect is the same as laying the board in a puddle of water and waiting for it to warp. 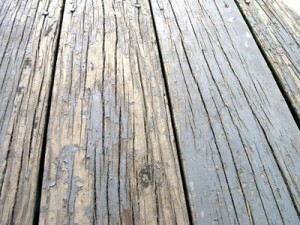 This picture shows what happens to a deck when a Group A sealant is used and the bottom of the board is left untreated. Has your wood been previously treated? Are you using the same product for the re-application? If not, we recommend completely removing the old sealant prior to applying the new sealant as there is the strong possibility that the two sealants could be incompatible. Whenever possible, it is best to use the same product every time the wood is treated throughout the life of the wood. 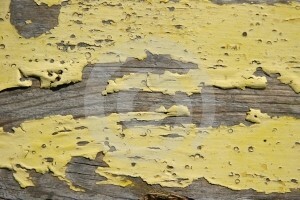 Applying a Group B sealant over a Group A sealant will likely result in peeling and flaking. There are some manufacturers that tell you that after their product has aged a few years it can be covered with any product. In our 15 years of deck treatment experience, we have found that to be untrue, especially when applying any Group B product over any Thompson’s Water Seal product. This picture shows what happens when incompatible sealants are used on top of each other. Remember, before treating any exterior wood, it is best to properly clean the surface to remove dirt, mold, and other contaminants. Allow the wood adequate time to dry out completely before applying the sealant. Please feel free to contact Tri-Pups, Inc. at 248-597-2929 with any questions you may have about the proper sealing of exterior wood surfaces.